TEAM Punta Gorda recently refreshed its free-to-the-public bicycle loaner fleet with the delivery of brand new yellow bikes and tricycles. 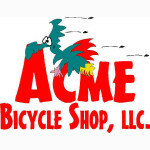 Acme Bicycle Shop owner Karen Freeman made the eagerly awaited delivery. 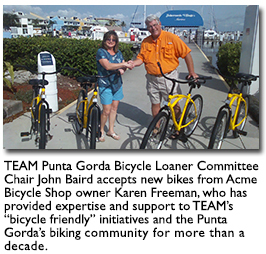 TEAM’s bicycle loaner program, in partnership with the City of Punta Gorda and supported by local businesses and private individuals, was the first such program in the State of Florida when initiated in 2010. Last year, the service provided bikes for more than 5,000 riders from 43 states, five provinces of Canada and 14 countries who explored miles of bike paths in and around the City. There are now 44 bikes available at five locations. Allow them to copy your ID and credit card [the copies will be returned to you when you return the bike(s)]. You will receive a lock, key, and required helmet. Hop on for a great ride! 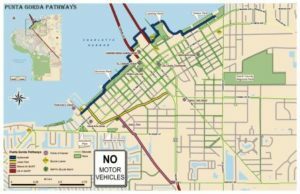 Punta Gorda Pathways Map. Click to view or download. 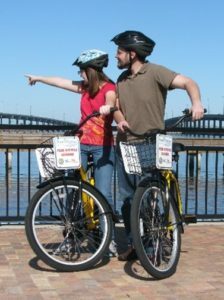 To guide you in your exploration, you are provided with both a Punta Gorda Pathways map and TEAM Bicycle Loaner brochure. PLEASE NOTE: The availability of bikes is constrained by the participating location’s operating hours. Generally, bikes must be returned between 3:30 and 4:30 p.m., but the actual hours are determined by the participating location’s management. TEAM welcomes a free will donation at bike stations to help offset the continued cost of fleet maintenance. The bicycle loaner program is an important component of TEAM’s “Bicycle Friendly” initiative. To learn more, or get involved, call TEAM at 941-637-8326 or email us at team@teampuntagorda.org.